Courses Approved by "BAR COUNCIL OF INDIA" (BCI). Law is a subject where you can develop a range of skills and explore many aspects of human life. Studying law as an undergraduate gives you the chance to sharpen your mind, strengthen your understanding and deepen your experience across the full range of humanities and social science. A law degree not only gives you the skill to be a successful lawyer but also a successful Businessman, Producer, Politician, Manager, Journalist, Police Officer or almost any other profession that requires intellectual strength combined with a practical approach to the world. Admission will be based on CLAT Exam. 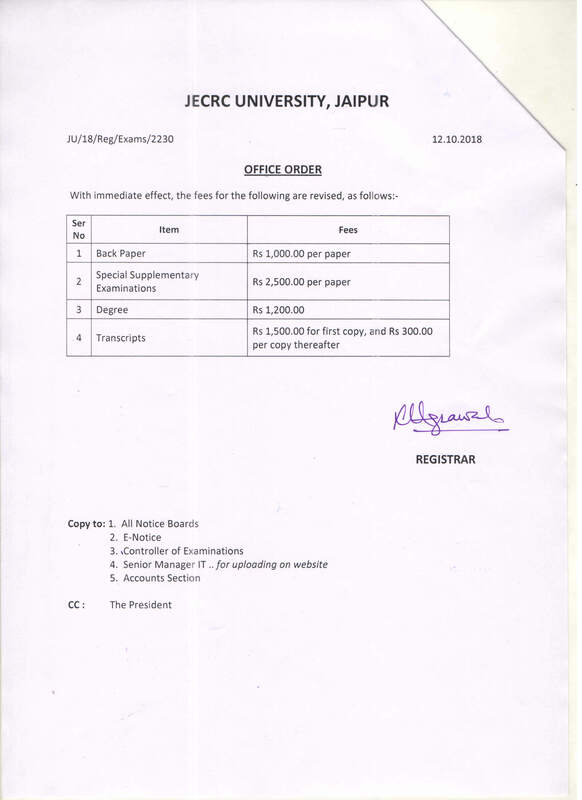 Candidates applying through Demand Draft are required to send their completed application form printout along with DD to the below mentioned address. JECRC University Campus, Plot No. IS-2036 to 2039, Ramchandrapura, Sitapura Industrial Area Extn, Near Mahatma Gandhi Hospital, Vidhani Village, Jaipur 303 905, Rajasthan, India. 3. Prospectus including Application Forms are available at the following places and can be bought by paying cash of Rs 500/-. (a) Applications are also available at Axis Bank in all over Rajasthan. (b) At the JECRC University Campus, Jaipur. *Note- Upon receipt of your Application Form with demand draft, an e-mail will be sent to your e-mail address. If in case you do not receive a confirmation, you may call @ 0141- 6565603 to 6565606, 6565615 or mail us at admissions@jecrcu.edu.in to find out the status of your application form. Candidates are recommended to utilize the service of Indian Speed Post while sending the documents. 1. It is mandatory to provide your email address (clearly) as it will be used by the Admission Office for further correspondence and communication. 2. Please do not attach any original Marks Sheet/Testimonials with the Application Form at this stage. 3. University/Board/Marks filled in the Application Form will be considered for all procedures related to admission. Any discrepancy found during original document verification may result in cancellation of Admission. 5. Incomplete Forms may be rejected. 6. 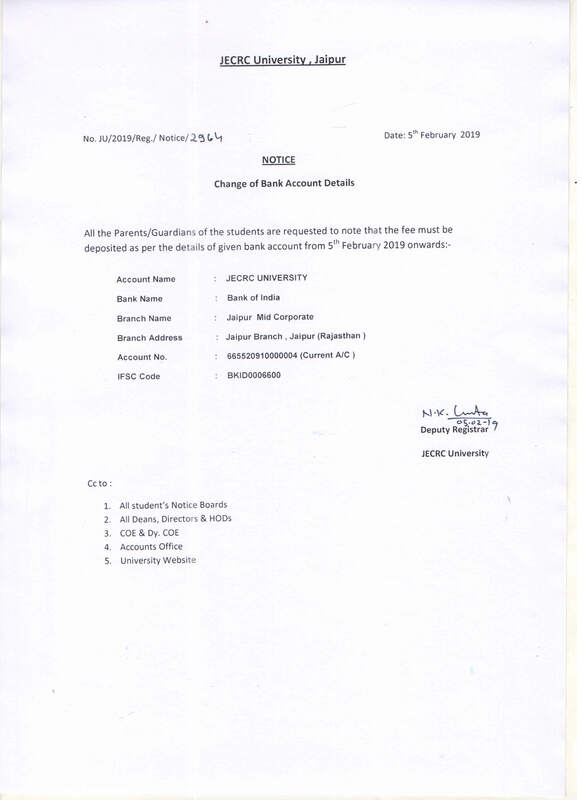 Details regarding payment of fee at the time of admission, allotment of hostel and date, time and venue for commencement of the academic session will be mentioned in the admission letter. 7. The offer of admission may be cancelled if any of the conditions are not fulfilled by the candidate by specified time.